↑ Lloyd, 15, citing Jonathan Israel. Perhaps only 1% survive today, and "only about 10% of these were of real quality". ↑ Jan Steen was an innkeeper, Aelbert Cuyp was one of many whose wealthy wives pursuaded them to give up painting, although Karel Dujardin seems to have run away from his to continue his work. See their biographies in MacLaren. The fish artist Jacob Gillig also worked as a warder in the Utrecht prison, conveniently close to the fish market.. Bankrupts included: Rembrandt, Frans Hals, Jan de Bray, and many others. ↑ Franits, 217 and ff. on 1672 and its effects. ↑ Franits, 65. 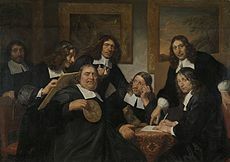 Catholic 17th century Dutch artists included Abraham Bloemaert and Gerard van Honthorst from Utrecht, and Jan Steen, Paulus Bor, Jacob van Velsen, plus Vermeer who probably converted at his marriage. Jacob Jordaens was among Flemish Protestant artists. ↑ Trip family tree. Her grandparents' various portraits by Rembrandt are famous. ↑ Ekkart, 17 n.1 (on p. 228). ↑ Ekkart, 130 and 114. ↑ Franits, 1, mentioning costume in works by the Utrecht Caravagggisti, and architectural settings, as especially prone to abandon accurate depiction. ↑ Fuchs, 39-42, analyses two comparable scenes by Steen and Dou, and p. 46. ↑ Franits, 180-182, though he strangely seems to discount the possibility that the couple are married. Married or not, the hunter clearly hopes for a return from his gift of (punning) birds, though the open shoe and gun on the floor, pointing in different directions, suggest he may be disappointed. Metsu used opposed dogs several times, and may have invented the motif, which was copied by Victorian artists. A statue of Cupid presides over the scene. ↑ Fuchs, pp 54, 44, 45. ↑ Explored at length by Schama in his Chapter 6. See also the analysis of "The Milkmaid (Vermeer)", claimed by different art historians for each tradition. ↑ Franits, 34-43. Presumably these are intended to imply houses abandoned by Catholic gentry who had fled south in the Eighty Years War. His self-portrait shows him, equally implausibly, working in just such a setting. ↑ Rembrandt owned seven Seghers; after a recent fire only 11 are now thought to survive – how many of Rembrandt's remain is unclear. ↑ and only a few others, see Slive, 128, 320-321 and index, and Schama, 414. The outstanding woman artist of the age was Judith Leyster. ↑ Fuchs, 111-112. Slive, 279-281, also covering unseasonal and recurring blooms. ↑ Slive, 158-160 (coin quote), and Fuchs, 147-8, who uses the title Brothel Scene. Franits, 146-7, citing Alison Kettering, says there is "deliberate vagueness" as to the subject, and still uses the title Paternal Admonition. ↑ Franits, 152-6. Schama, 455-460 discusses the general preoccupation with maidservants, "the most dangerous women of all" (p. 455). See also Franits, 118-119 and 166 on servants. Prak, Maarten, "Guilds and the Development of the Art Market during the Dutch Golden Age." In: Simiolus: Netherlands Quarterly for the History of Art, vol. 30, no. 3/4. (2003), pp. 236-251. หน้านี้แก้ไขล่าสุดเมื่อวันที่ 25 กุมภาพันธ์ 2562 เวลา 08:34 น.